We use energy every day. We plug in our electronic devices, drawing energy that has been converted into electricity, but which originated in a waterfall on a spinning turbine, a wind that turned a windmill, the burning of coal to produce carbon dioxide, a nuclear reaction, or other sources. We drive cars, in which the energy released from a chemical reaction heats gas in a chamber, pushing a piston which drives a crankshaft that ultimately causes the wheels to turn. Many of our sources of energy depend on chemical processes. Solar power, for example, depends on photochemistry. When a photon from the sun is absorbed by an atom of the right kind of material, an electron hops from one energy level to a higher one. That event leaves behind a "hole", a place where an electron used to be. An electron might move in from a neighbouring atom to occupy that hole. Now the original electron can't fall back to where it came from; it will instead need to drop into a hole on the next atom. We now have electrons moving from one atom to the next. We have electricity. The burning of gasoline and coal depends on expanding gases which push against a turbine, like wind against a windmill. The gases expand because they get hotter when the combustion, or burning, reaction happens. But why do these reactions produce heat? That's related to the formation of chemical bonds. When chemical bonds are formed, energy is released. The formation of a chemical bond always releases energy. Over the course of a chemical reaction, old bonds are frequently broken and new ones are frequently made. But if energy is always released when bonds are formed, what happens when a bond is broken? When a bond is broken, energy is consumed. It costs energy to break a bond, but the formation of a new bond pays some energy back. Breaking a chemical bond always costs energy. So, if breaking bonds costs energy, and making bonds pays energy, and energy becomes heat, then a reaction will only produce heat if the energy released when the bonds are made is more than the energy consumed when bonds were broken. We need to replace weaker bonds with stronger ones. Burning carbon-containing compounds, like wood, coal, or gasoline, is a fantastic way to release energy and make heat. Our ancestors have known that since the stone age. Carbon-containing compounds generally contains lots of carbon-carbon and carbon-hydrogen bonds (which are actually quite strong). When burned, they produce carbon dioxide and water, which contain carbon-oxygen and hydrogen-oxygen bonds, and those bonds are even stronger than the carbon-hydrogen and carbon-carbon bonds that were broke. Overall, energy is released. We can use that energy to warm ourselves on a cold night under the stars, to cook our food, to drive a mill that manufactures steel, or to fly an airplane. We can use that energy to get work done. Thermodynamics is the study of the relationship between heat (or energy) and work. In other words, thermodynamics looks at how we can put energy into a system (whether it is a machine or a molecule) and make it do work. Alternatively, we might be able to do some work on a system and make it produce energy (like spinning the turbines in a power station to produce electricity). In chemistry, we sometimes speak more broadly about "energetics" of reactions (rather than thermodynamics), because energy given off during a reaction may simply be lost to the surroundings without doing useful work. Nevertheless, the ideas are the same: energy can be added to a set of molecules in order to produce a reaction, or a reaction can occur between a set of molecules in order to release energy. A classic example of reaction energetics is the hydrolysis of ATP to ADP in biology. This reaction is used in the cell as a source of energy; the energy released from the reaction is frequently coupled to other processes that could not occur without the added energy. The hydrolysis of ATP, or the addition of water to ATP in order to break ATP into two, smaller molecules, gives off energy. That energy can be used by the cell to carry out other processes that would cost energy. One molecule of ADP and one molecule of inorganic phosphate, sometimes abbreviated as Pi, are also produced. Energy can be given off by a chemical reaction. That energy can be used to power other reactions that require energy. In the cell, ATP is produced in high levels in the mitochondria. Because it is a relatively small molecule, it can be transported easily to other areas of the cell where energy may be needed. The ATP can be hydrolysed on site, providing energy for the cell to use for other reactions. Note that the scheme above uses some thermodynamics jargon. The place where the reaction takes place, or the molecules participating in the reaction, are called "the system". Energy is supplied to "the surroundings", meaning places or molecules other than those directly involved in this reaction. There are a couple of other ways in which energetics of reactions are commonly depicted. 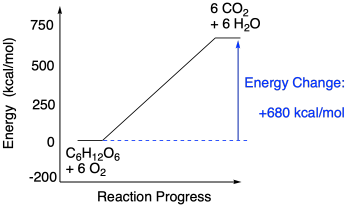 The energetic relationship between ATP plus water and ADP plus phosphate shown above is really a simplified graph of energy versus reaction progress (sometimes called reaction coordinate). 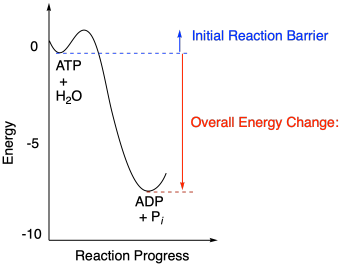 This type of graph shows changes in energy over the course of a reaction. 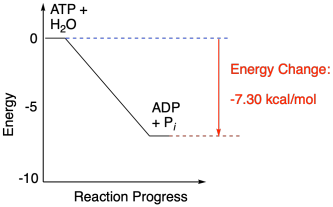 The energy of the system at the beginning of the reaction is shown on the left, and the energy at the end of the reaction is shown on the right. This type of graph is sometimes referred to as a reaction profile. Another common way of discussing energetics is to include energy as a reactant or product in an equation describing the reaction. An equation for a reaction shows what the starting materials were for the reaction, and what they turned into after the reaction. The things that reacted together in the reaction are called the "reactants". They are written on the left hand side of the arrow that says a reaction took place. The things that the reactants turned into are called the "products". They show up on the right hand side of the arrow. For the hydrolysis of ATP, energy is simply included as one of the products of the reaction, since the reaction releases energy. Alternatively, the energetic observation about ATP can be turned around, since there are evidently some reactions that cost energy. Probably the most well-know reaction of this type is the conversion of carbon dioxide to carbohydrates such as glucose. This conversion actually results from a long series of different reactions that happen one after another. Overall, the process requires a lot of energy. This energy is supplied in part by ATP, generated with assistance from photosystem I and II, which are arrays of molecules that interact with sunlight. A simplified reaction profile for carbohydrate synthesis is shown below. Energy can be consumed by a chemical reaction. Reactions that consume energy need an energy source in order to occur. Again, this energetic relationship can be thought of in the form of a balanced reaction. In this case, energy is a reactant, not a product. It is one of the key ingredients needed to make the reaction happen. Reactions that produce energy, like ATP hydrolysis, are referred to as exothermic reactions (or sometimes exergonic, meaning roughly the same thing). 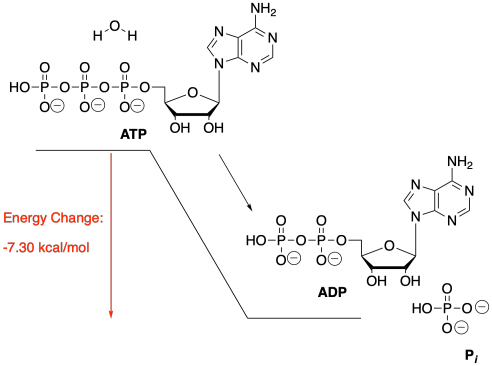 In reaction profiles, these reactions go downhill in energy as the reaction occurs from the left side of the diagram to the right. On the other hand, reactions that cost energy (the ones that go uphill on the reaction profile, like carbohydrate synthesis) are referred to as endothermic (or sometimes endergonic). It is useful to think of reactions as "going downhill" or "going uphill" because one of these situations should seem inherently easier than the other (especially if you've ever been skiing). 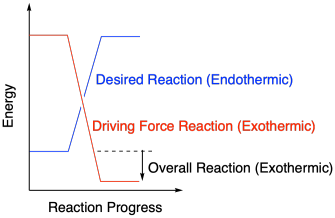 Exothermic reactions (the downhill ones) occur very easily; endothermic reactions do not (those are the uphill ones). Systems always go to lower energy if possible. Reactions that are energetically "uphill" cannot happen easily by themselves. Those reactions must be powered by other reactions that are going downhill. The energy traded between these reactions keeps chemical reactions going, in cells and other important places. Sometimes, a process that is used to supply energy for another reaction is thought of as the "driving force" of the reaction. Without the driving force, the desired reaction would not be able to occur. In general, a reaction will occur if more than enough energy is supplied. Excess energy does not hurt on the macroscopic scale. However, if not enough energy is supplied to make up for an endothermic reaction, the reaction is not likely to happen. Energy is a lot like money. It can be passed from one set of hands to another. Doing so often helps get things done. There is one problem with the use of chemical reactions as sources of energy. If ATP hydrolysis releases energy, and if the release of energy is always favoured, why doesn't it happen spontaneously? In other words, why don't all the ATP molecules in all the cells in all the organisms in the whole world just slide downhill into ADP right now? What is stopping them? Fortunately, all reactions have barriers that stop them from happening until they are ready to go. A reaction barrier is an initial investment of energy needed to get things started. Reaction barriers occur for a variety of physical reasons: two molecules may need to get oriented in the right direction to react with each other, or a bond may have to be broken to get the reaction going, costing an initial outlay of energy. The reaction barriers of reactions influence how quickly reactions happen. High barriers slow reactions down a lot. Low barriers allow them to happen more easily. The study of reaction barriers, and how quickly reactions can occur, is called chemical kinetics. Thermodynamics, on the other hand, is really concerned with the overall energy change from the beginning of a reaction to the end. It compares the energies of two sets of molecules to each other: the energies of the reactants and the energies of the products. Which of the following reaction profiles describe reactions that will go forward, as opposed to ones that will probably not occur? Structure & Reactivity in Organic, Biological and Inorganic Chemistry/span> by Chris Schaller is licensed under a Creative Commons Attribution-NonCommercial 3.0 Unported License.